Tim Cook visited the NPR offices in Washington, D.C., in 2015. On Monday, he spoke with NPR about Apple users' privacy and the importance of trade to global relationships. "We've never been in the data business," Apple CEO Tim Cook told NPR on Monday, responding to a report that Facebook struck agreements giving Apple and other device makers access to Facebook users' personal information. Information on users' relationship status, religion and political leaning is among the private data that became available under partnerships between Facebook and at least 60 device makers, The New York Times reported. "The things mentioned in the Times article about relationship statuses and all these kinds of stuff, this is so foreign to us, and not data that we have ever received at all or requested — zero," Cook told NPR's Steve Inskeep and Laura Sydell during the company's annual conference for developers in San Jose, Calif.
Cook has become a public advocate for privacy, calling it a "fundamental human right." He has spoken out against the business model of rival big tech companies, such as Facebook, which profits from targeting advertising to users based on personal data. Apple's business model relies on selling hardware and services. Earlier on Monday, Apple announced a new app to allow users to get reports on how much their kids are using particular apps on their iPhones and iPads. The Screen Time app will let parents set time limits on how long their children can use apps, from Netflix to Snapchat, said Craig Federighi, Apple's senior vice president of software engineering. Screen Time would also allow parents to limit access to some apps and websites. One option is designed to get kids to unplug from their devices at bedtime. "We have never been about maximizing the number of times you pick [the device] up, the number of hours that you use it," Cook told NPR. "All of these things are great conveniences of life," he said. "They change your daily life in a great way. But if you're getting bombarded by notifications all day long, that's probably a use of the system that might not be so good anymore." The new feature will be part of the next Apple mobile operating system, iOS 12, which is expected out later this year. In the interview, Cook spoke about the potential for an escalating trade war, as the Trump administration moves to impose tariffs on key U.S. trading partners. "Countries that have a significant level of openness ... are the [countries] that thrive over time," Cook said. "Trade brings people closer together ... and I think that's true about countries as well," he added. "It helps a set of broader issues when there's trade going on." Cook has been Apple's CEO since August 2011 and is the first CEO to run the company since the death of founder Steve Jobs. Cook's soft-spoken Alabama accent and genteel Southern style is a marked contrast to Jobs, who had a dynamic and electrifying presence on stage when he introduced new products. Cook's critics say the company hasn't brought such groundbreaking hardware to the market under his leadership. Yet, under Cook, the value of Apple stock has nearly tripled and is fast approaching $1 trillion. The products introduced under Cook, such as the Apple Watch and Apple's HomePod smart speaker, haven't made the kinds of waves that previous devices did. But analysts say Apple Watch sales are far outpacing other leaders in the wearable market such as Fitbit. 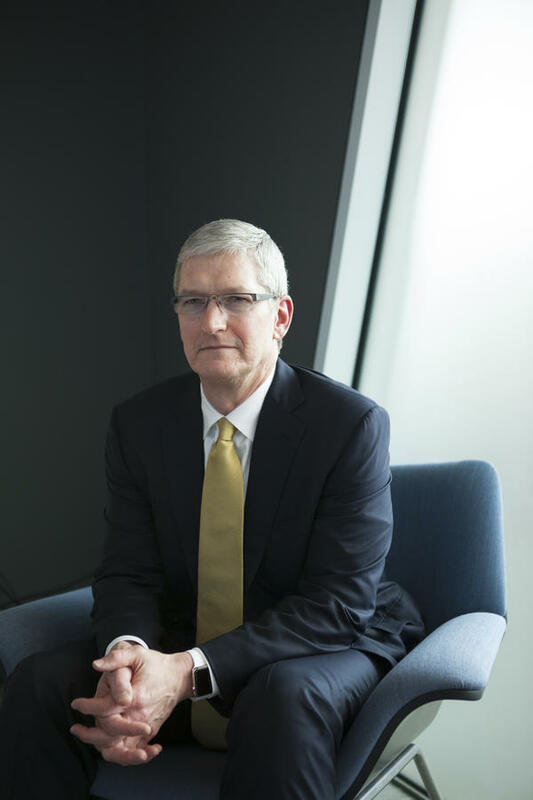 Cook is also responsible for introducing Apple Pay and he's significantly increased Apple revenue with services such as music and cloud storage. And I'm Steve Inskeep in San Francisco. Just south of here yesterday, the CEO of Apple took the stage. INSKEEP: Tim Cook had reason to be cheerful. He runs the world's most valuable company worth close to a trillion dollars. He was addressing software developers, promoting new features to the operating systems of the iPhone and the iPad and the Apple Watch. COOK: Changing the world and making it a better place is what it's all about for us. INSKEEP: That's the motto for much of the tech industry, though it faces unprecedented questions about whether the industry really is making the world better. Apple's shareholders recently warned of growing societal unease about the mental health effects of too much phone use. So now Apple says a new feature will make it easier to track what you or your children have been doing on a device. COOK: So you know how much time you're spending, where you're spending it, how many times per hour you're picking up a device, how many notifications you get, who's sending those to you. INSKEEP: That's how Tim Cook described it when he sat with us after his speech. What, if anything, bothers you about the amount of time people are spending on your phones? COOK: Well, if you back up and think about what we're about, we've never been about maximizing usage of our devices. It's never been a focus of ours. There's clearly users out there that are worried about the amount of time they're spending, or the amount of distraction or interruptions they get. INSKEEP: I want to ask about your thinking, though, because you could say, I'm responding to demand and there's some shareholders that wanted this, but are you actually bothered? Are you actually concerned by the possibility that what you argue is a social good could be a social detriment? COOK: I think there are cases in life where anything good used to the extreme becomes not good. And so I think you can depend on your device so much and spend so much time on certain apps or pick up your phone so many times during the day that this is no longer good. INSKEEP: But this was literally your ambition as a company, right, to make sure that people use everything? INSKEEP: But you maximize the number of things you can do with it. That's for sure. COOK: We do that, yes, because we want it to be an incredible device for you. And so, you know, we've provided a way for you to have health information on it, financial information, you can pay with it. But if you're getting bombarded by notifications all day long, that's probably a use of the system that might not be so good anymore. INSKEEP: Is there a little bit of conflict that you have to think about because you are offering people ways to limit their screen time while speaking to this giant conference of thousands of people, developers, who are in business to go sell products through your app store that would encourage people to use the phone more? COOK: No. I don't see it as that because we always put the user at the center. And so our question is always, what is in their best interest? INSKEEP: Do you agree with people who use the word addiction, talk about addiction to smartphones? COOK: I'm not a clinician, and so I don't know. What I do know is that you can use something too much. And I'm concerned about it. But what we want to do is provide you great tools so you can make a judgment for yourself. INSKEEP: You also made some news by announcing some changes to your Web browser and elsewhere, which you say will make it more difficult for outside parties to track what you do online, to track your data. Are you deliberately making your platforms more hostile for companies that do business like Facebook, which was mentioned in your presentation? COOK: We're not targeting any single company. We're targeting a practice of people collecting information without the vast majority of users knowing that it's being collected. We think that when a person leaves one website and goes to another and another and another, they do not have a reasonable expectation that that original website is still following their every move. And so we want to do what we can do there to try to prevent that. But we're not taking the ability of if somebody, you know, is on the NPR app, we think it's fine that, in rational, that NPR knows that person is there and knows something about them, assuming the user has elected to share that. What we don't think is, when you leave there, we don't think that the surveillance engine should stay. INSKEEP: I want people to know that you have emphasized that your company does not intend to make money off of data mining, does not intend to make money off of advertising. You make money by selling hardware. But you're addressing a developers conference here, where theres a lot of app developers who may well rely on advertising, who may well rely on data. COOK: Well, let me let me correct something you said there. We don't believe there's anything wrong with digital advertising. It's a key part of people's business models, and we think it's perfectly fine. It's the crafting of a detailed profile, and tracking you in places where you don't reasonably expect to be tracked and companies gathering information well beyond what you would have voluntarily shared if you knew what they were doing. INSKEEP: Is there a better business model than the business model that lots of companies are using? COOK: Again, on the digital - we have no issue with digital advertising. INSKEEP: Excessive data tracking, you do have an issue. COOK: It's the collection of information beyond what the person is fully and completely aware is taking place and the building of this detailed profile. I think that steps over a boundary. INSKEEP: That's some of our talk with Apple CEO Tim Cook here in California. We're hearing him throughout the morning. NPR digital culture correspondent Laura Sydell was with us for that talk and is with us now. Hey, Laura. INSKEEP: So we heard Apple pushing back on Facebook there, but just a couple days ago there was this story suggesting that Apple in some cases has been in league with Facebook. SYDELL: That is right. As a matter of fact, what was reported was that Facebook made it possible for the hardware manufacturers like Apple or Samsung to essentially get all kinds of personal information off their app, including your friends and your friends' personal information. INSKEEP: OK. That's what the story said. What did Tim Cook say? SYDELL: Tim Cook says we could have done it, but we didn't do it. All we did was try to make things more convenient so that maybe you could post something to - you could post a photo on Facebook, and that's about it. They are not in the business, as he said, of getting users' data. SYDELL: Yes. And, in fact, a lot of these apps do it. So even though they are not doing it, the apps in their app store may very well be involved in it. INSKEEP: NPR's digital culture correspondent Laura Sydell this morning talking about her interview with Apple's Tim Cook. Transcript provided by NPR, Copyright NPR.